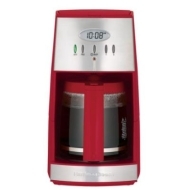 alaTest has collected and analyzed 20 reviews of Hamilton Beach Ensemble 12-Cup Coffee Maker - Red. The average rating for this product is 4.3/5, compared to an average rating of 4.4/5 for other products in the same category for all reviews. Reviewers are impressed by the price. The usability also gets good comments. There are some less positive opinions about the reliability and size. Views are divided on the maintenance. We analyzed user and expert ratings, product age and more factors. Compared to other products in the same category the Hamilton Beach Ensemble 12-Cup Coffee Maker - Red is awarded an overall alaScore™ of 80/100 = Very good quality. First coffee maker ive purchased and im satisfied with it for the price. Hamilton Becah Coffee Maker is red hot! I had been looking for a red coffee maker for quite some time. Simple design, yet very effective! I HAVE BOUGHT 6 COFFEEMAKERS IN THE LAST 5 YRS. IF THEY DID NOT QUIT ON ME, THEY WOULD NOT KEEP THE COFFEE HOT AFTER IT BREWED, OR WHEN YOU POURED IT, IT WOULD SPILL ALL OVER! THIS COFFEEMAKER SOLVED ALL THESE PROBLEMS! PLUS IT IS A NICE LOOKING SETUP!!! !